Organic hyssop is a member of the the Lamiaceae or mint family. It is native to Southern Europe and Asia. The Hebrew people called this herb azob , meaning "holy herb." In ancient times hyssop was used for cleansing temples and sacred spaces. The Romans used hyssop as a protective measure from the plague. In ancient Greece the physicians Galen and Hippocrates recommended hyssop for inflammations of the throat and chest, pleurisy, and other bronchial complaints. Organic hyssop essential oil is most well known for its effectivity at boosting the immune system to combat colds and respiratory infections. It is also efficacious in the treatment of cold sores and herpes, probably because of the stimulation of the body's defense mechanisms. It’s diaphoretic properties promote perspiration and the detoxification of the body by sweating out toxins and impurities. The oil assists a speedy recovery from wounds and bruises due to its anti inflammatory and antiseptic benefits. The analgesic and antispasmodic properties of hyssop make it ideal for soothing tired and sore muscles, the compound responsible for this effect is thought to be isopinocamphone. The oil is also effective for skin ailments such as eczema, dermatitis, acne, and such because of its cleansing and antiseptic properties it thoroughly cleanses the face. Studies have indicated that hyssop essential oil exhibits significant anti-HIV activity. The olfactory quality of the oil reduces anxiety and promotes a sense of well being. Organic hyssop essential oil is a therapeutic and fresh addition to cosmetic applications, personal care formulations, soaps, perfumery, incense, candles, and aromatherapy. 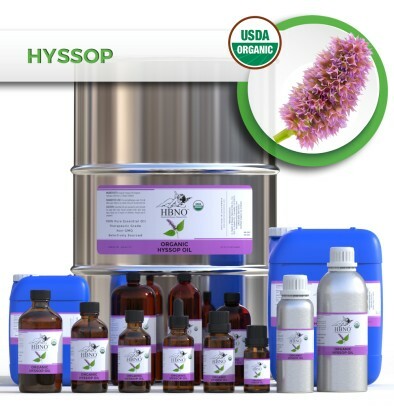 HBNO is pleased to offer USDA organic hyssop essential oil in bulk and wholesale quantities. We can supply any amount of oil needed to anywhere in the world.